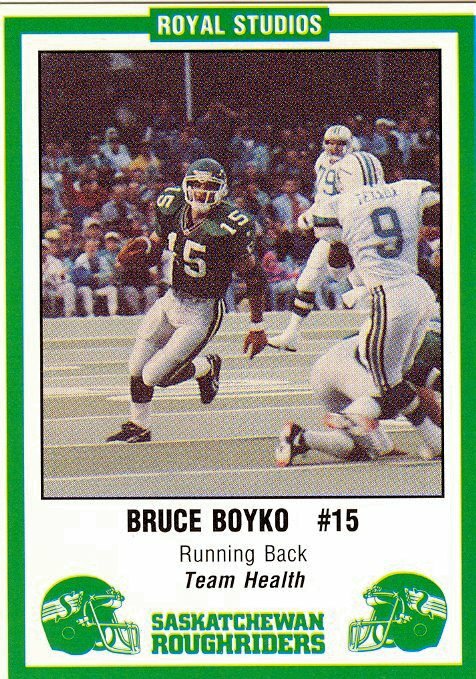 Boyko was drafted in the second round (9th overall) n the 1990 cFL college draft by the Saskatchewan Roughriders. Boyko played seven seasons (1990-96) with the Riders, initially seeing action mainly on special teams but getting more chances to contribute offensively at FB or SB as his career progressed. Boyko's most productive season came in 1993 when he had 20 carries and 30 pass receptions. In March of 1996, Boyko was drafted by Montreal in a non-import draft to restock the non-import on the team after its move from Baltimore. Montreal traded Boyko back to Saskatchewan along with OT John James and RB Willie Latta for K Dave Ridgeway, FB David Pitcher, OT Matthieu Quiviger, DB Anthony Drawhorn and OT Dan Payne. After playing one more season in Saskatchewan, Boyko became a free agent and signed with Winnipeg in March of 1997. Boyko was released by winnipeg just prior to the start of the 1998 season and was signed by BC on July 23, 1998. He was released after just three games and signed again with Winnipeg in August of 1998. In 1999, Boyko was a free agent again and resigned with Winnipeg in August. Boyko had one blocked punt in 1990.